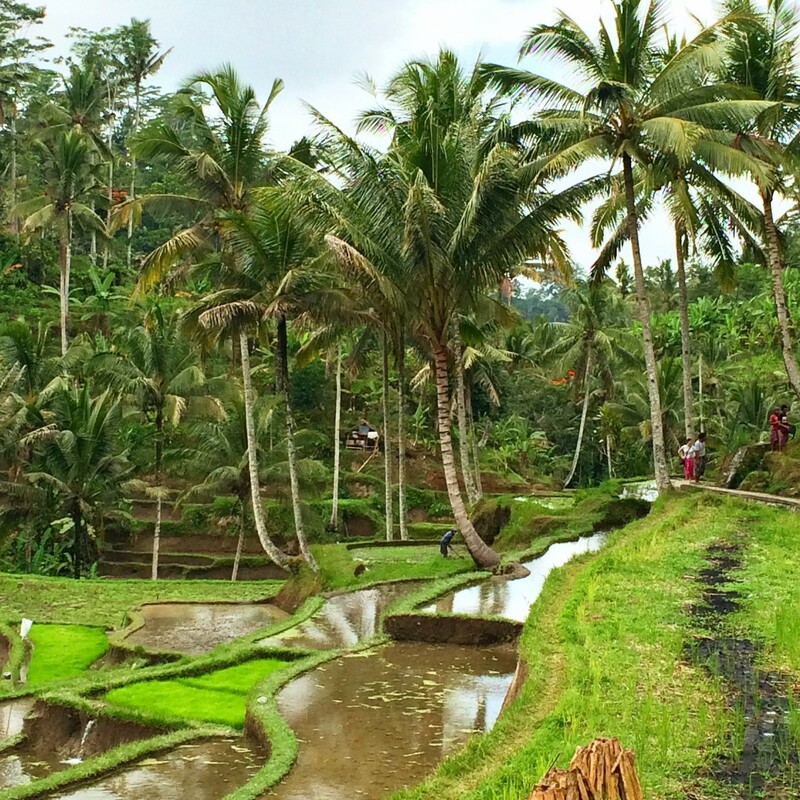 I simply fell in love with Ubud. This place is magical and drives you in a peaceful state of mind as you couldn’t immagine it. This is yet not enough for you? Everything is slower in Bali and you will need a lot of time for anything . To not get crazy about this you need to calm down too. Find a peaceful hotel in the middle of the jungle and outside of the city, you will not regret it. I stayed at the Chili Ubud Cottage, an amazing place, where you become once with the nature, literally. The beds are really comfortable and I slept like a baby . The staff was helpful and friendly. We had to make some phone calls for the Spa reservations and they assisted us with this at all times. 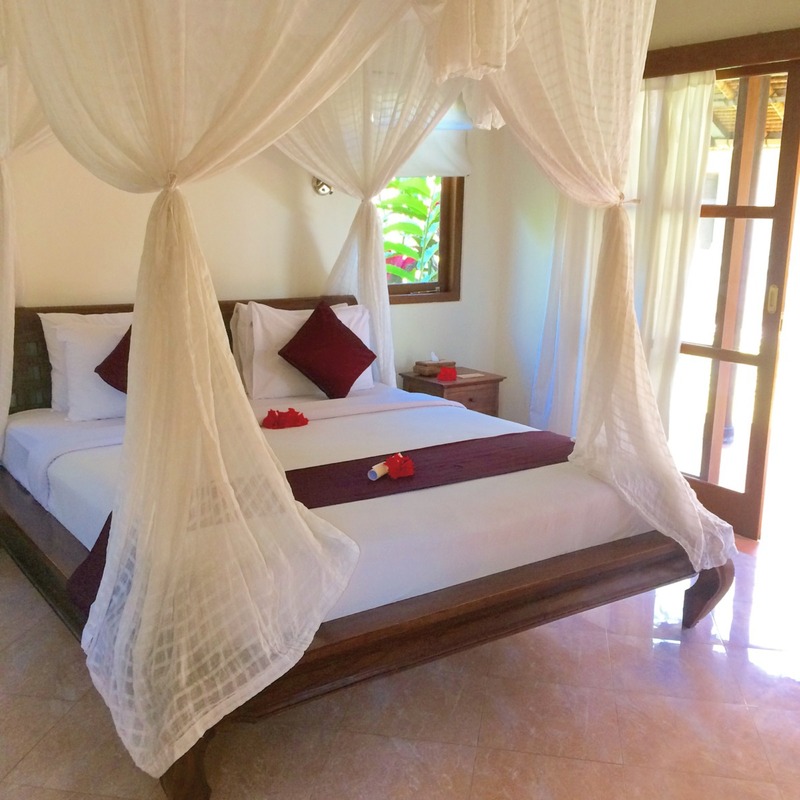 The base for enjoying the stay in Ubud is having a peaceful place, just find the one, that is right for you. To really enjoy your Eat-Pray-Love experience you need to visit a Spa or go to a Yoga retreat. Best Yoga classes I’ve heard are offered from The Yoga Barn Studio. I decided to go with the Spa. Our first choice after a lot of internet research was already fully booked, so we went with the second best choice based on quality and price: The Sang Spa 2. The only differences between these two are the less particular treatment offerings. We booked the ‘Holistic Sang Spa Package’ . 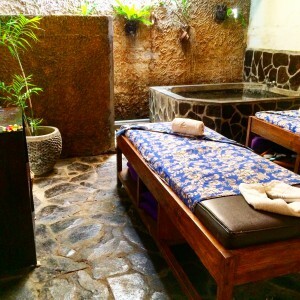 The package included an amazing Balinese massage, scrub, body wrap and hair treatment. Also Manicure and Pedicure was included, but I think Bali is simply not the best place to go with those. It was alright, but I would recommend you to bring your own nail lack because the colour offering is limited. All in all it was an amazing day and I came out feeling like a new person, I would definitely recommend this place. Culture wise Bali has a lot to offer. If you see the different temples, the rice fields, the vulcans and the various art villages, you get a better feeling of Bali’s Culture and life of the Balinese. Don’t miss out to see as much as you can during your stay in Ubud. The travel distances are really short. 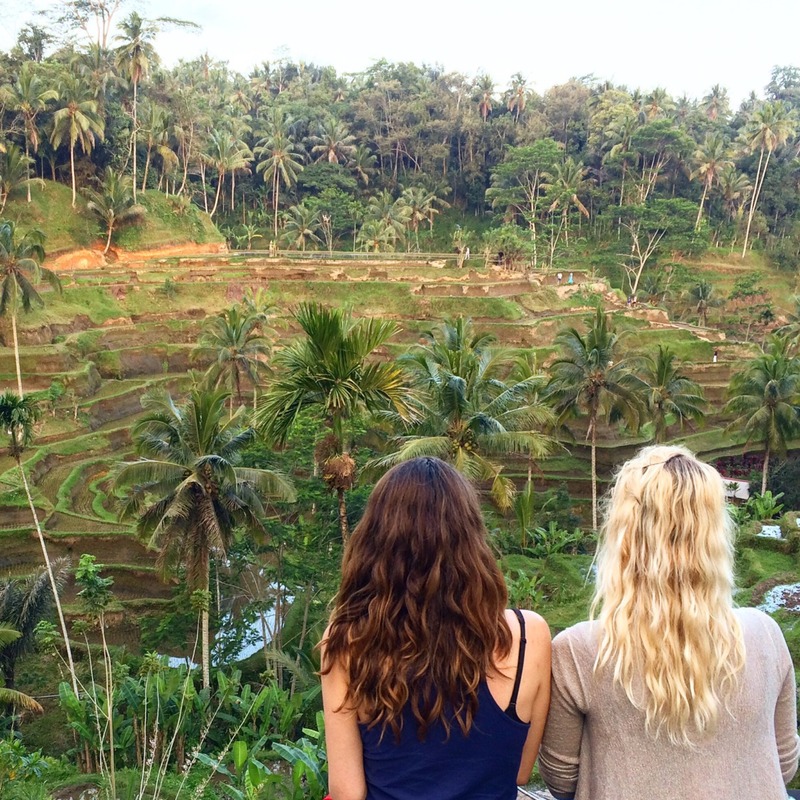 The Tegalalang rice terraces are the biggest and most beautiful ones and you don’t even have to enter and walk all the steps to get a first class shot of them. The temples are really interesting in sense of architecture, but you will also get a better feeling of how the Balinese people live. 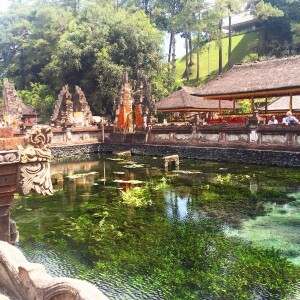 My personal favourite in Ubud’s area is the Tirta Empul temple. But be aware to bring a Bikini. This makes the jump in the holy water so much easier. The people there will try to sell you small offerings for their god, before entering the water, but be aware, that this is a tourist scam and the only thing you have to pay is the fixed entrance fee of 15.000 IDR and 15.000 IDR for the clothing, because otherwise they won’t allow you to enter the holy water. Don’t even think about missing out on the Monkey Forrest. This is definitely one of the funniest experiences that you will have here. 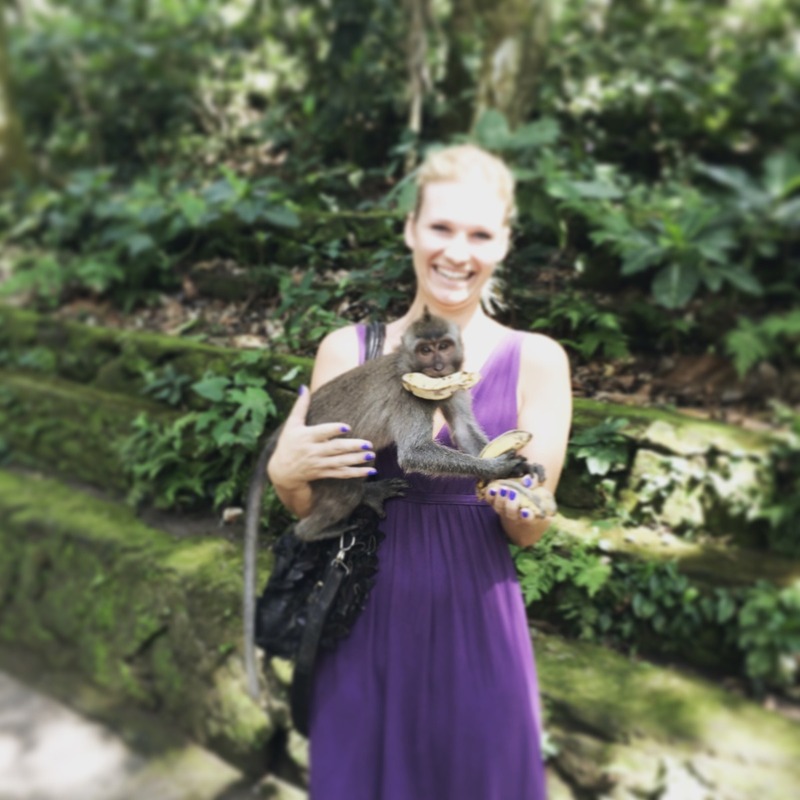 I did not know what to expect when approaching the monkeys, but if you try to avoid the big monkeys you will see how fun they are. The monkeys will climb on you faster than you can say cheese for the foto, so have the camera ready. The entrance fee for the monkey forrest is 20.000 IDR and another 20.000 IDR for the bananas, if you haven’t bought them before. If you are a coffe lover you should go to see a coffe plantation, we have been to the Oka agriculture Bali. 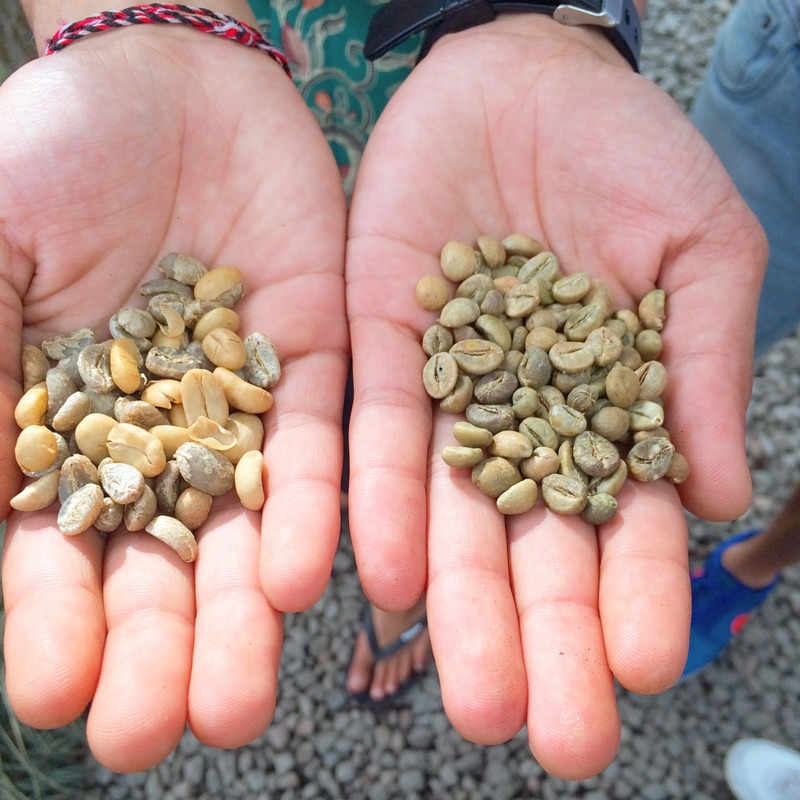 They offer you free coffe to try and guide you through the production process. The most interesting part is the Luwak coffe, which is made out of the coffee beans, that a small (and very cute!) animal eats as cherries, digests and expels. This coffe is supposed to be one of the best and most expensive once you can find on the island. A Luwak Coffee in any restaurant in Bali will cost you the same as a whole dinner menu, so be sure to try it on the plantation. The Legong dance is a typical and old tradition in Bali, showing the beautiful god winning over the bad creatures, that tried to get the power over the heaven. 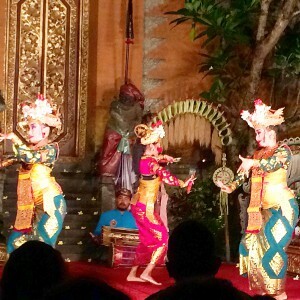 You can see it best at the Palace in Ubud for around 80K IDR , but go there on time because it gets really crowded every night and you will not find any good place to see the show anymore. I went on this adventure with a pre organised tour from “Giri Dhana”, that covered three different temples, the rice fields, the coffee plantation and the volcano. The tourist information stand is just on the monkey forrest street, 14 in Ubud and for 150.000 IDR (circa. 10 euros) you have the driver for the whole day. The tours mostly are only with two or four people, which gives you the possibility to change and adapt everything to your wishes. They also offer individual tours and to rend a driver for a whole day costs you the same, than this tour guide. 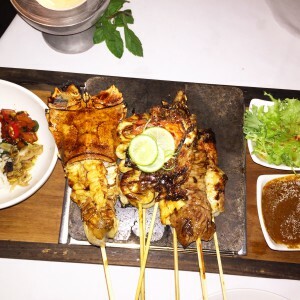 The Balinese kitchen offers asiatic food but is much more delicious for the European taste. Avocado, fruits, chicken and shrimps, you can find anything you like and this for un incredible price. I had a 3-course meal with a delicious cocktail for 12 euros. When you have relaxed enough and have seen and done everything that is to be done in Ubud, and you still have some time, go shopping! 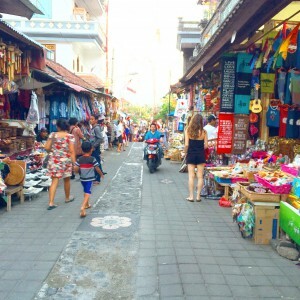 Ubud has a nice market in its centre next to the Palace. There you can find cheap parreos for 20.000 Rubel and really nice typical Balinese art. Also the shops along the monkey Forrest road invite to spend some money on clothing, but don’t be surprised when the prices here are similar to the one’s back home. I hope you will enjoy this place as much as I did and feel free to write me if you have any questions. If you are interest to know more about Bali’s areas click here. For general Bali travel tipps click here. And here you can find all my Bali posts ! 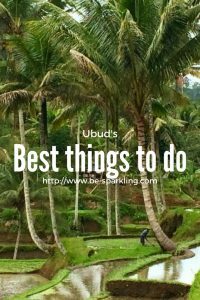 Ubud is another paradise that I wish to explore someday hopefully this year. 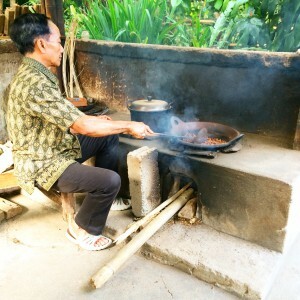 With your story, I find Ubud be very mysterious which adds to its appeal. I agree, Bali is a great place to relax. Looks like you enjoyed both the relaxing opportunities and local culture. So much greenery! So much natural beauty! 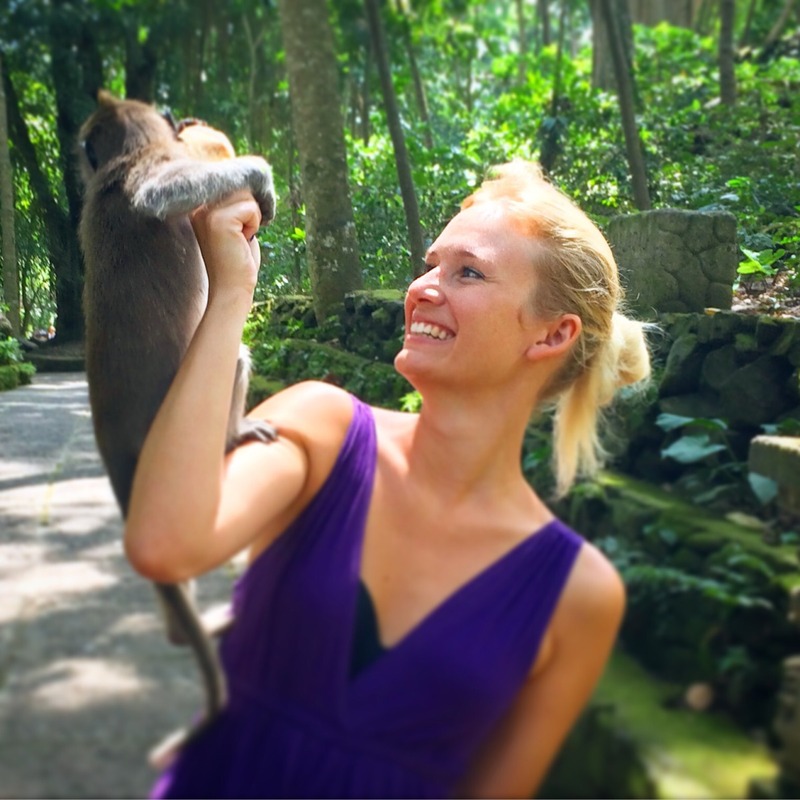 My friend visited Ubud for her honeymoon and couldn’t stop raving about the place! Hope I’ll get to go soon too! Sometimes all you need is some absolute peace and this place is perfect!!! 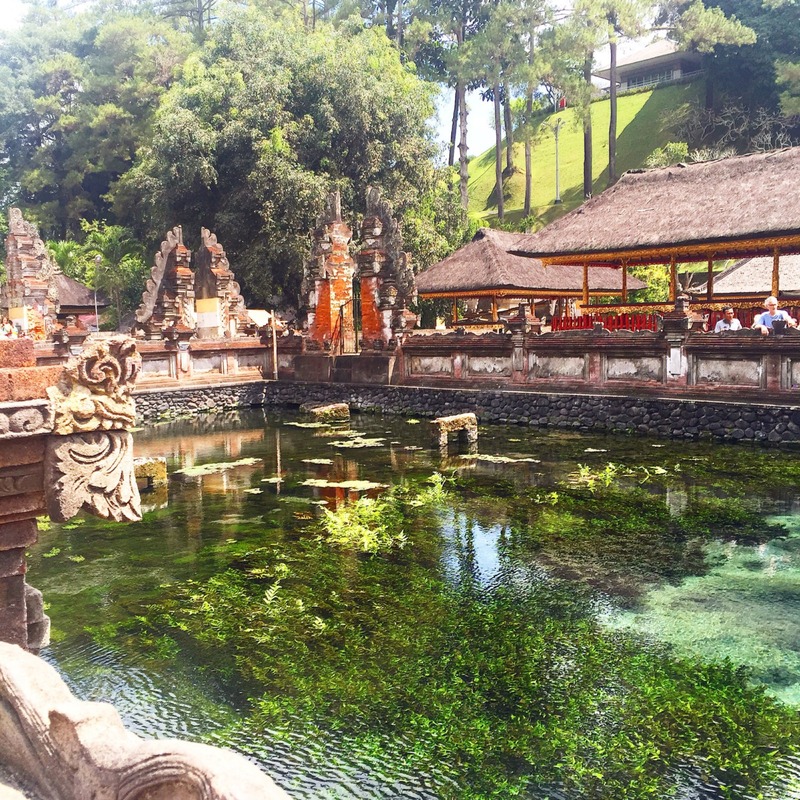 Bali is truly a paradise and your pictures speak for itself! I haven’t yet explored that part of Asia but hope to visit soon! This made me miss Ubud! I can’t believe you were brave enough to let the monkeys climb on you :O! I was way too afraid! Your pictures of the rice terraces are stunning. Ubud is such a lovely cultural experience. I remember my journey there, though I was terrified of those monkeys. They were such mischief mongers. Loved the cultural show here as well as the artisan workshops. Thanks for refreshing those memories.